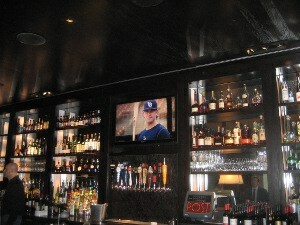 Boston’s Post 390 blanketed with SpeakerCraft speakers and Crestron automation. Providing audio, video and automation for a bar and restaurant is rarely easy. It’s even more difficult when the restaurateur has various and specific goals in mind. Take Post 390, for example, which is located steps from Boston’s most bustling office buildings, making it an after-work cocktail location. It’s also located a couple of blocks from Boston Back Bay’s bar scene, making it a night-on-the-town location. But Post 390 is located a stone’s throw from Boston’s trendy South End restaurants, making it an up-scale eatery. In other words: Post 390 needs to be a chameleon, adjusting to the needs of various guests – and its audio, video and automation need to reflect that. Dias enlisted North Easton, Mass.-based Audio Video Intelligence (AVI) to design and install Post 390’s electronics. The restaurant is two floors, with a bar area on each floor, and the dining rooms blend into the bars. There are two areas that can be dedicated for private parties, complete with drop-down Epson projectors and Da-Lite screens, that require separate automation and audio zones. As such, AVI installed 87 SpeakerCraft speakers and subwoofers, mostly in-ceiling, in the 12,000-square-foot space. Speaking of money, Post 390 didn’t skimp when it came to automation. Post 390 staff use Crestron automation to control audio, video, motorized screens, lighting and climate. It’s always a challenge anytime various employees need to interact with a control system, so Dias wanted it to be as simple as possible. During the design phase, Shapiro sent Dias screen captures of the customized Crestron interfaces AVI programmed for Post 390. He liked what he saw. Dias, whose Himmel Hospitality Group runs other prominent Boston and Cambridge restaurants, has been burned before by difficult-to-use automation systems. Post 390 demonstrates extreme confidence in its Crestron automation system by including in-wall touchscreens in the two private dining areas. Nothing is stopping a customer in one of those rooms to select music, turn down volume or even lower the projector and screen – although it’s obviously not encouraged. The private rooms are only private when Post 390 designates it so. The larger of the rooms includes a large glass door that can be opened when that room is simply used for dining space and closed when privacy is needed. The audio zones need to reflect the rooms’ usage and Post 390 staff uses Crestron audio switching via touchscreen to change on the fly. Staff training was a snap, Shapiro recalls. He remembers being on-site for a soft opening and waiting for employees to ask questions about how to use the automation system but hardly getting any. For him, that’s a measure of success.